Fencing -- Probably the most straightforward solution, fences have long been the go-to for homeowners seeking seclusion. Be sure to check city ordinances and HOA policies before installing one. Hedges -- Shrubs like boxwood and privet are commonly planted along property lines. Choose an evergreen variety for year-long privacy. Make sure it's suited for your climate and matures to your desired height. Screens -- Stylish and effective, folding wood-panel screens add a nice visual element while blocking unwanted views. Opt for a weather-resistant screen designed for the outdoors. Trellis -- The lattice configurations on these simple wooden structures offer an element of privacy. They're also a perfect host for climbing vines and plants if you'd like additional coverage. Just be sure to check the sunlight and care requirements for the vegetation you plant. Pergola -- A pergola helps block views from second-story windows and balconies. It can be as simple or intricate as you'd like and will offer a degree of shade along with privacy. Drapes -- Budget-friendly and chic, panels help screen off your patio and can be moved as desired. Make sure the fabric is suitable for outdoor use or spray it with a water-resistant coating. Vertical Garden -- If you're looking to increase privacy and also want to grow your own herbs, consider a living wall. You can buy prefabricated tower planters for easy installation. If neighborly noise is a problem, a water fountain is a relaxing, sound-muffling solution. 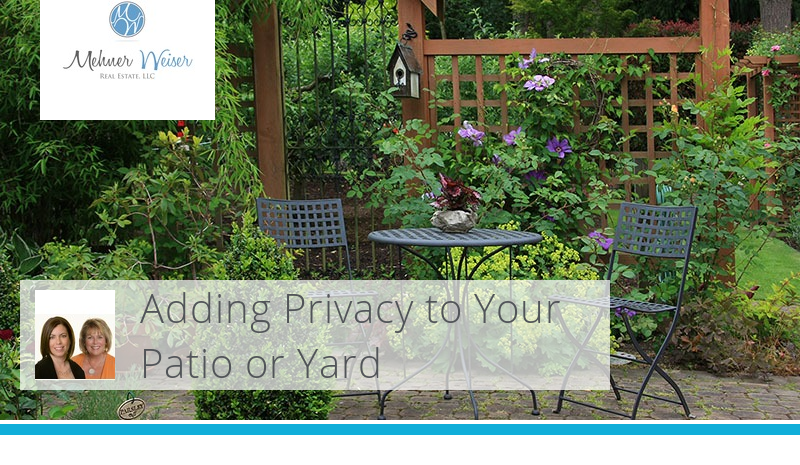 Consider your outdoor space and choose the privacy-adding options that work for you.